112 Edmund is a seven story mixed-use retail, office and residential complex situated alongside historic mansions in the Brush Park Neighborhood of Detroit, MI. The building aims to link the traditional architectural features and character of the neighborhood with the more contemporary developments sprouting up throughout this area. The pedestrian experience is prioritized, as the street level facade pulls back and creates packets of space that facilitate social interaction. OOMBRA is working closely with City Planning as the new Form-Based Code is being developed. 112 Edmund is a seven story mixed-use retail, office and residential complex situated on the John R commercial corridor alongside historic mansions in the Brush Park Neighborhood of Detroit. This development looks to bring back the density and activity that once filled this entire neighborhood. 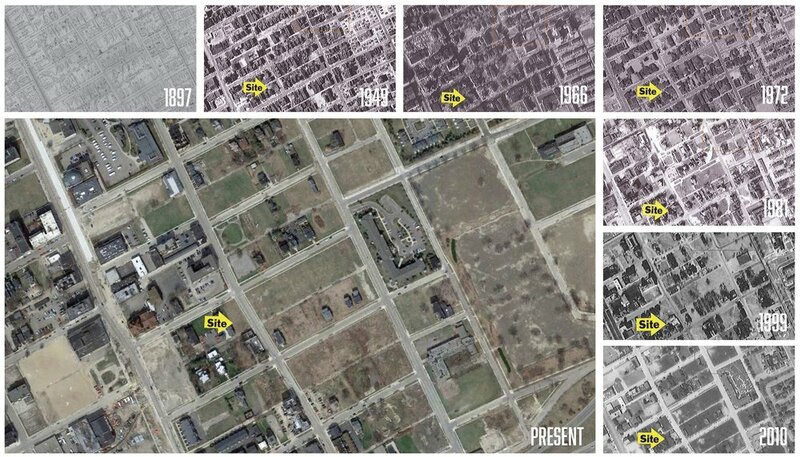 URBAN FABRIC REPAIR Detroit’s population peaked at 1.85 million in 1950. A 2015 U.S. Census notes that number to be about 680,000. Contributing to the decline was over-reliance upon a single industry, rise of the suburbs, racism in housing, the 1950s and 1960s construction of I-75 and I-375 freeways, and the Riots. Parts of Detroit are so abandoned they have been described as looking like farmland, urban prairie, and even complete wilderness. Three years after the City emerged from the largest declared bankrupcy in municipal history, signs point to a resurgence. When city services and amenities have been ravaged what kind of project can thrive? The pedestrian experience is prioritized, as the street level facade and retail pulls back from the street and creates pockets of space to facilitate and encourage social interaction. 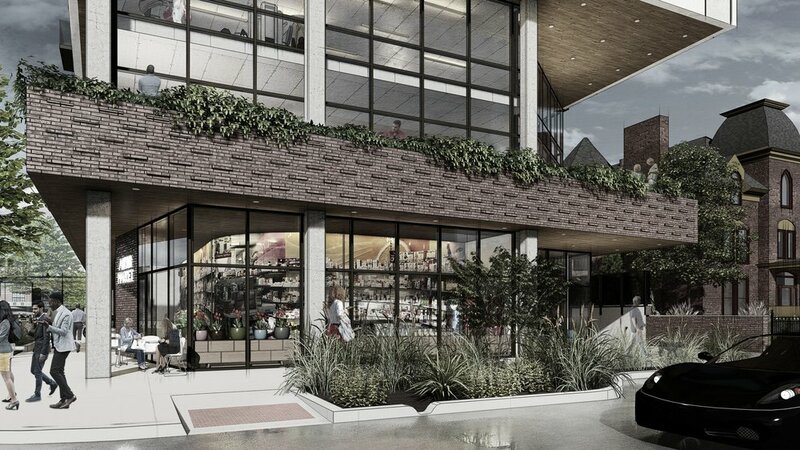 A horizontal brick fascia band separates program uses and stitches together an historic material palette in the neighborhood allowing elements of continuity throughout the design. A glass reveal at the commercial office levels provides relief in the facade and separates base and tower. The top of the building steps back from the facade to provide visual relief from the street and against the Lucien Moore home, but also doubles as outdoor terraces for penthouse residents. A green roof gives solar relief to the building and offsets the flow of water entering the City’s storm sewer system, reducing water runoff through transpiration. 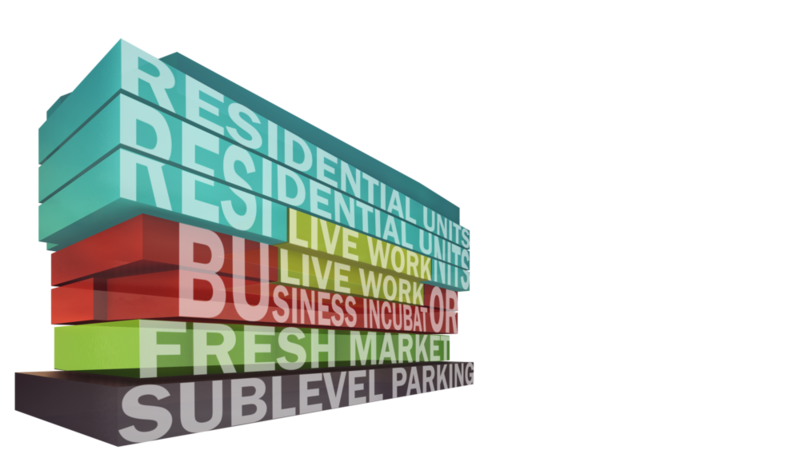 Underground parking is provided for the residential units and an adjacent mixed-use parking facility provides the required spaces for the commercial and retail uses. PLANNING AND SYSTEMS EFFICIENCY Simple, efficient plans with stacking utility cores provides plug-and-play efficiency and flexibility. With an eye on the construction cost, a 5-over 2 podium construction—also known as pedestal or platform construction—was selected that includes 5 stories of light framing over a fire-resistive 2-story podium (+ sublevel parking) of type-I construction. Structural bays are layed-out for maximum efficiency of the the Use within and play nice with standard 9-foot wide parking spaces in the sublevel.